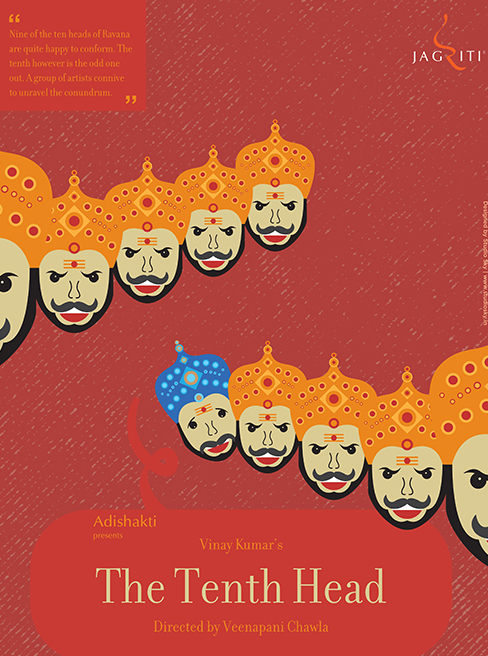 In the play, nine of the ten heads of Ravana are a company who are quite happy to conform to a common way of seeing things. Their individuality is limited to each representing one of the nine emotions/ bhavas, from the traditional Indian aesthetic. The tenth however is the odd man out. He does not fit in graphically or psychologically with the other nine heads. He does not want to dumb down so as to be the average man in the collective. And he believes that nine heads on a torso make greater geometric and aesthetic sense than ten. So tentatively he looks either for independence from the others or failing that an equitable relation with them so that he can give free expression to his unique thoughts. He asks a group of artists to work around the conundrum of his visibility in graphic representation. However it becomes increasingly apparent that the tenth head is quite different from the other nine; for he has a totally unique take on Ravana’s actions with regard to Kubera, war, flying and Sita, among other issues. In the end he quietly finds his own solution to the problem, while the artists highhandedly impose their skewered interpretation of the ten heads on the world and posterity.